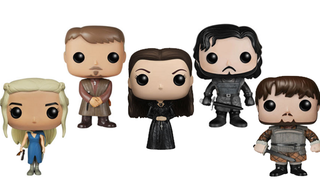 Just in time for Christmas, Funko are releasing yet another wave of their Game of Thrones Pop! Vinyl figures - and it's a great wave, made even greater by the presence of Sansa. Not just any Sansa, either - Sansa in her swanky new getup from the show's latest season. Excellent! They're all pretty great - I'm partial to the new Daenerys, much prefer that to her 'Khaleesi' look - but Sansa really is the star. Even Sophie Turner's excited!